Tesla CEO, Elon Musk has confirmed their plan to enter India before the production of Model 3 begins. Tesla has finally pulled the covers off its affordable mass market sedan – Model 3. The car was unveiled at a special event a few days back and recently. At the unveil, Musk has confirmed that deliveries for the car will began by end of 2017, while customers for all the prospect markets, which includes India, can pre-book the car for an initial token amount of $1000 US Dollars. Reservation may be cancelled at any time, in which case customers will receive a full refund of the booking amount. He also announced the base price of the Model 3 that will start at $35,000 US Dollars which is a little over Rs.23 lakhs (before taxes). At the event, Elon also added that there will also be a India-wide Supercharger network. 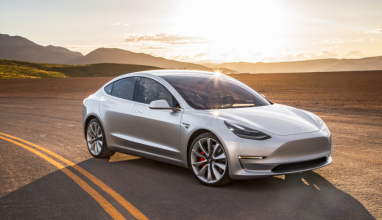 The Tesla Model 3 is one of the most anticipated cars from the American car manufacturer. The car shares most of its design and style cues with the Tesla’s flagship sedan, the Model S. Before unveiling, Tesla CEO Elon Musk tweeted about the major markets where new Model 3 will be sold with India in the list. At the event Elon Musk claims that the car will deliver at least 215 miles or 346 km of range. That said the company hopes to exceed those number in the production version. Deliveries will begin by the end of 2017. Indian Luxury car buyers are already started enquiring about Tesla’s launch in India. We are also happy that Indian car market is getting upgraded with power pack features & Hybrid technology.